PNY Technologies (PNY) considered one of the worldwide leaders in consumer electronics market and flash memory products, has launched a range of efficient flash drives for storing all your digital files. The HP v236w/v232w/v237w are compact and stylish pen drives that offer massive storage and functional performance for storing and transferring your files. Each of these pen drives feature lidless and durable design with integrated strap-hole or clip for portable and easy operation. With high-quality metal outer casing and a slim, streamlined outline, these pocket-sized pen drives can store unlimited amount of personal data, movies, images, music in their 64GB memory space, while comfortably fitting inside your back pocket or wallet. The HP v236w features ergonomic design with a durable metal casing with opaque plastic casing at end of the body. It weighs 6.4g and measures at H 5 mm x W 14.8mm x L 45mm dimension. It comes in a capless form and strap hole located at the end of the drive making it practical and can prevent it from being lost. PNY utilizes anti-fake electronic plating after printing technic to all its flash drives to prevent counterfeiting, so users can easily distinguish between genuine PNY products against fake counterparts. The HP v263w features this advanced technology with original HP logo imprint in its body. The HP v236w is available in 8GB/16GB/32GB/64GB variants. It supports all versions of Windows operating system and Mac OS: 10.3 with 2-year limited warranty. 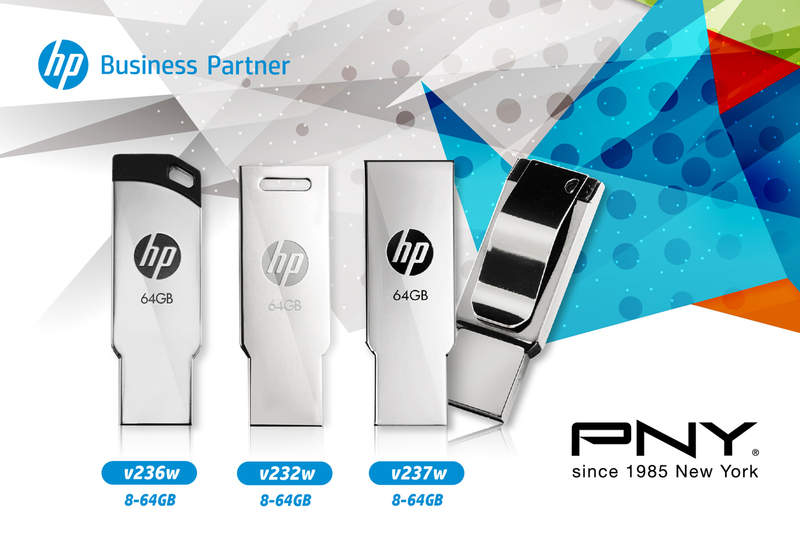 HP v232w is an elegant and long-lasting pen drive with durable and streamlined ergonomic design with a natural feel making it easy to grip and use. It has a robust body to ensure the drive retain its shiny and sleek appearance. PNY utilizes anti-fake electronic plating after printing technic to all its flash drives to prevent counterfeiting, so users can easily distinguish between genuine PNY products against fake counterparts. The HP v232w features this advanced technology with original HP logo imprint in its body. To enhance its portability, the drive features a lidless design with an integrated wide strap hole that can be attached to keyrings, mobile straps or handbags. The HP v232w is also available in 8GB/16GB/32GB/64GB memory storage and offers 2-year limited warranty. The HP v237w is a practical and good-looking flash drive with sleek and streamlined construction which delivers professional business style and charming appearance. It comes in smooth metallic casing so the drive retains its shiny and reflective surface. It also sports the HP print logo and has undergone anti-fake electronic plating after printing technic so users can easily distinguish between genuine PNY products against fake counterparts. The functional clip design can be clipped on to your shirt pocket or notebook for convenience and added style. It offers 5-proof technology that makes your memory storage water proof, shock proof, temp proof, magnetic proof, and vibration proof, so you can be assured your files are safe and secure no matter where you use it or take with you. The drive is extremely lightweight and weighs only 7.7g and measures at H 5 mm x W 14.8mm x L 43mm. It also comes in storage capacities ranging from 8GB to 64GB and offers 2-year limited warranty and can be purchased at an affordable price range.